Well, a weekend during which Greece seems to have been finally able to pass muster on its bond deal, while Mario Draghi has given the official "all clear" on the debt crisis seems to be as good a moment as any to have a look at where the country which many investors consider likely to be the next to enter the restructuring process is up to. Speaking after last week's meeting of the ECB’s governing council Mr Draghi said the recent three-year long-term refinancing operation (LTROs) had been an “unquestionable success” and had “removed tail risk from the environment” For the uninitiated "tail risk" is defined by Wikipedia as "the risk of an asset or portfolio of assets moving more than 3 standard deviations from its current price in a probability density function.Such risk is often under-estimated using normal statistical methods for calculating the probability of changes in the price of financial assets". Now I'm not exactly sure whether a two percentage point shift in bond yields over a 12% starting point - or a movement of about 16% in two weeks - counts as tail risk in the technical sense, but it sure looks like it should do, and this is basically what just happened to Portugal. Portuguese bond yields are rising as investors are busy putting cheap money from the European Central Bank to work elsewhere. The increase in 10-year borrowing costs by almost two percentage points in the past two weeks is stoking concern among investors that the nation will struggle to resume bond sales in 2013. 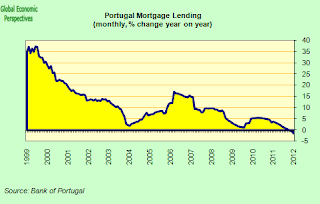 Portugal has been unable to sell debt due in more than a year since it was given a 78 billion-euro ($102.8 billion) bailout in May 2011, following Greece and Ireland......Portugal’s 10-year yield was at 13.83 percent at 12:07 p.m. in London, up from 7.48 percent a year ago. The extra yield investors demand to own the nation’s bonds rather than Germany’s widened 1.1 percentage points to 12.04 percentage points since the ECB announced its program of three-year loans to banks on Dec. 8. Italy’s spread shrank 124 basis points to 3.2 percentage point, and Spain’s narrowed 53 basis points to 3.26. So why would people think that Portugal might be the next to need a second bailout? Well, what the Greek historian Thucydides would have called the efficient cause would be the fact that it has a 9.3 billion euro bond redemption due in September next year and the despite initial Troika hopes, the markets remain closed tighter than the lips of Angela Merkel were to the supposedly amorous advances of Silvio Berlusconi. 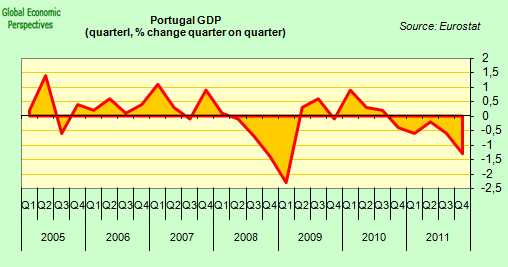 But the final (or underlying) cause which will send Portugal into a second bailout is the fact that the country has a high level of debt (both public and private) and a chronic growth problem which won't simply be turned round by a bit of good will and a few "magic wand" structural reforms. So essentially the numbers just don't add up. So Just What Are The Numbers? With interest rates on 10 year bonds up around 14% it certainly won't be. 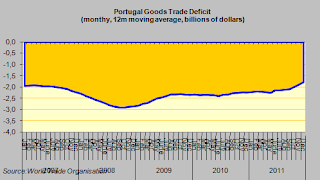 According to the Troika calculations Portugal had sovereign debt of 102.7% of GDP in 2011, and a budget deficit of 5.9% broadly in line with the target laid down in its bailout package. Yet, despite the fact that the Portuguese reform programme was recently described by the WSJ (following the lead of the IMF) as being on track, the deficit numbers were, in fact, only saved by a last minute scramble which involved transferring funds (5.6 billion Euros or 1.9% of GDP) from the banking-sector pension system to the government social security one, in order to achieve what the IMF consider a short term accounting benefit. There were also questions raised as to whether this was not "short term gain for long term pain" in another sense, since the government has also to assume future liabilities for bank pensions, and several experts have queried whether these liabilities were transferred on a "fair value" basis, or whether indeed some sort of disguised longer term (in the short term the bank balance sheets take a hit) subsidy to the banking system was not in fact indirectly provided. In their second review of the programme (published in December) the IMF said the following: "Staff questions both the timing of the transfer and the appropriateness of in effect using an accounting technique to mask the true fiscal position". That is to say the Fund has a double role here - to talk the efforts of the Portuguese administration up before the world's press, and to try and keep the politicians in line in the background. So achieving last years target was not easy (see above chart which comes from an excellent research report from Citi analyst Jürgen Michels and his team), with the day only being saved was by a one-off transfer, a technicality which means that this years deficit reduction will effectively be from a real base of 7.8% of GDP (5.9% + 1.9%) to 4.5% (or 3.3 percentage points), which is significantly larger than the 2011 reduction which was really from 9.1% in 2010 to only 7.8% (or 1.3 percentage points - ie the fiscal "effort" in 2012 will be two and a half times as big as the 2011 one). Without the accounting "fudge" revenue would have come in significantly under target, and this highlights one of the big problems in all the deficit reduction programmes that are currently in place on Europe's periphery, namely that the economic contraction associated with austerity programmes (in uncompetitive economies) produces a severe fall in revenue, one which is not necessarily associated in linear fashion with the output fall itself. For example, a 10% fall in retail sales demand may produce a much more dramatic fall in profits, which means that tax income from profits can be almost wiped out. This is one of the problems the Greeks have been constantly up against, and was surely partly behind last years big Spanish budget target "miss", and while many stress that programme implementation issues are fewer and farther between in Portugal than in Greece they are hardly negligable looking at the country's track record, so the adminstration will be permanently struggling to meet 2102 revenue targets. As well as revenue shortfalls, government expenditure also overshot, largely due to greater than planned capital expenditure. 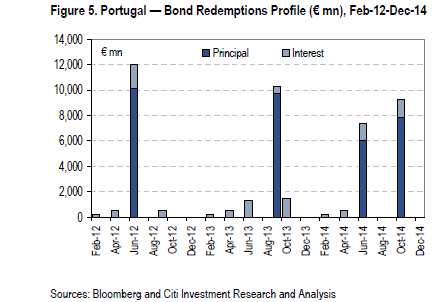 The reasons for the non-compliance with expectations on the capital spending side are interesting, since they mainly derive from the needs of Portugal's state-owned companies (SOEs) and transfers made to Public Private Partnerships (PPPs), which surely form an important part of the programme slippage risk. 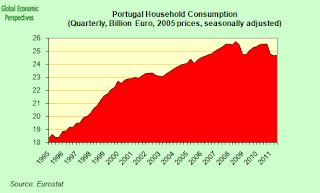 Anyone who has recently read my recent post on the true level of Spanish debt should not be the least surprised to find that similar issues exist in Portugal (for explanations of methodology see the Spanish post). 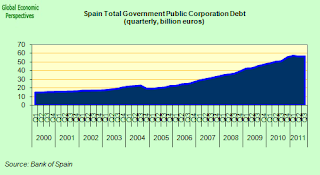 As in the Spanish case the government provided guarantees for SOEs, so it has contingent liabilities and might be forced at some point to take over the debt. According to IMF estimates, explicit guarantees to Portuguese SOEs (including those outside general government accounts) represented anywhere between 10% and 15% of GDP in mid-2011. Then there are the PPPs. These are especially important in Portugal, and the value of the government's ultimate exposure may be something like 14% of GDP. Such partnerships have been popular politically since they have the accounting advantage for governments that, as the private sector holds the debt and the state simply services it, the outsanding quantity doesn't count as state debt for Eurostat EDP purposes. Indeed such schemes have even been marketed to government agencies on just these grounds, as I pointed out in an early post on the topic - Just What Is The Real Level Of Government Debt In Europe? (February 2010). PPPs are often used to finance infrastructure programmes, with the government paying a charge to use the infrastructure until final ownership is assumed at the end of a defined period. In the Portuguese case such "rents" amount to about 1% of GDP annually. Then, naturally, there are the accumulated unpaid bills. 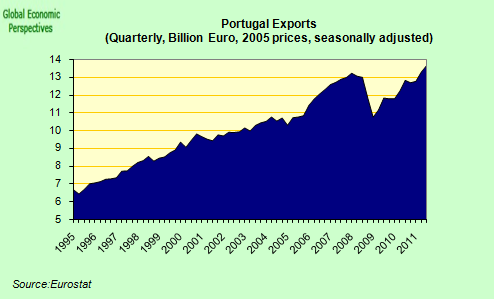 According to Eurostat data Portugal had 8.8 billion Euros worth at the end of September last year, or around 5% of GDP, although note that some of this will be normal trade credit, so the Portuguese government's own estimate of 3.5% of GDP which should be counted as debt may not be that far from the mark. Also, banks need recapitalising, and the IMF estimate that the banking system will need funding to the tune of about 4.7% of GDP in 2012 alone. So the 2012 deficit objective is challenging, and the risks to the debt path are not negligible, but the main issue determining where Portugal goes from here is not whether or not the country will be able to go back to the markets at the end of next year, but whether or not the country's economy is able to make the growth leap assumed in the IMF debt forecasts. According to the latest set of projections, the IMF anticipate a GDP contraction of 3% in 2012, to be followed by a return to growth at a rate of 0.7% in 2013. Crucially though, the Fund anticipates a growth rate of 2% or more on a more or less constant basis from 2014 onwards. This assumption is based on the impact of the proposed structural reforms which are more or less similar in all the programme countries - namely reform of the public adminstration to reduce the size and cost of the public sector, product market reforms to improve competitiveness (in this case especially in the telecommunications sector), and labour market reforms. Now I have no doubt at all that most of these reforms are badly needed, I just doubt they will have the kind of "growth surge" impact that is being widely assumed. 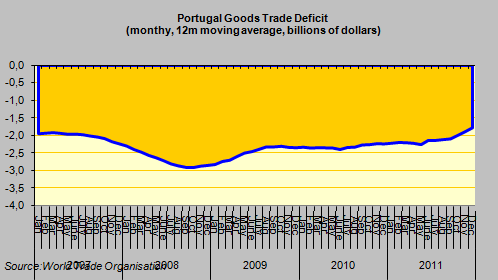 The Portuguese long term GDP trend has been heading strongly downwards in a most noteable way for a decade and a half now, and turning this around will involve a lot stronger force than seems to be being anticipated. In addition, Portugal has an ageing workforce which will surely be a growth rate negative, and the current deep economic recession is leading to substantial human capital loss, as young people leave to find work and a better life elsewhere. In fact these kinds of negative feedback loop are simply not considered in the kinds of growth model the EU and the IMF use, but are very important in determing the future path of an economy, as I try to argue in this presentation I recently gave in Riga (referring to the Latvian case). It's not that I think the growth rates being offered are too optimistic, I think they are based on a theoretical model which is by-and-large out of date. "Restoring competitiveness will require improvements in productivity accompanied by an internal devaluation. As productivity gains will materialize only gradually, the program will continue to focus on measures to lower input costs, increase the competitiveness of domestic production, and allow for a reduction in non-tradable prices.....In particular, significant adjustment in wages is needed in the short run, before reforms enhance productivity over time. In this regard, public sector wages cuts, extension of working hours, and the decision to redesign the extension of collective wage agreements and not to grant automatic extensions during 2012 are welcome.". Following a pattern previously established in Latvia, Hungary and Greece, public sector wages and pensions are being reduced - principally by means of a 2-year suspension of the extra two (summer and xmas) monthly payments of both wages and pensions (the IMF estimate that this is equivalent to a 12-percent average cut), but while this reduces pressure on public finance, the mechanism via which this would produce an increase in competitiveness in the tradeables/export sector is far from clear, to me at least. Perhaps it is worth noting at this point, that Hungary has implemented most of the measures being proposed in Portugal without visible impact on the country's growth rate. The only measure which it seems to me would start to lower wage costs in the private sector (as opposed to the improved productivity path, which the fund itself admits will be slow) would come from a measure to decentralise wage agreements in the way the new Spanish law allows, and let wages in the private sector fall steadily. But this would of course be deflationary, and hence would have its own impact on debt sustainability. In fact IMF forecasts are based on CPI inflation of around 1.5% annually between 2013 and 2016, so they themselves are hardly expecting any serious deflation, or even the relatively mild kind which the country experienced in 2009 (-0.9%). So it looks to me pretty much like the country is facing a long period of adjustment (possibly over a decade) just like its Spanish counterpart, and it is unrealistic to think it won't need support throughout this period. Simply put, the difficulty of implementing a correction of the magnitude Portugal needs within the framework of a common currency has been greatly underappreciated by policymakers right from the outset. Portugal's gross domestic product shrank 2.8% in the fourth quarter on an annual basis, and fell 1.3% from the third quarter, according to the latest data from the National Statistics Institute. 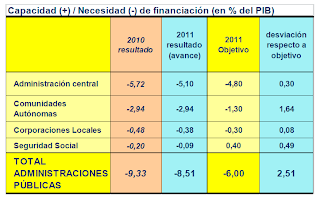 For 2011 as a whole, the economy contracted 1.6%, as compared with a 1.4% growth in 2010. Last year, exports rose 7.4%. Growth got worse as the year progressed, showing the country is being hit by the slowdown in other countries in Europe and elsewhere. 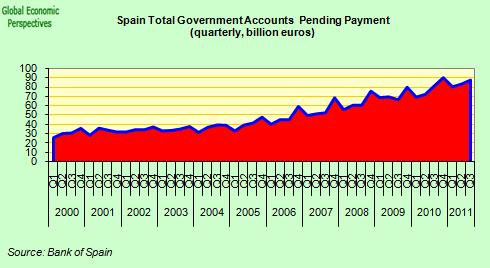 With domestic demand falling, and government consumption being cut back the country is now largely dependent on exports for growth, but with the country's largest export market, Spain, also undergoing its own austerity program this growth is getting harder to come by. The chart above, which only shows data up to the end of September, makes plain how exports had surged following the ending of the first European recession, offsetting the negative trend in household demand. But the latest data show that while net trade was a positive element in fourth quarter GDP, this was largely the result of a very sharp fall in imports. Year on year exports were up 5.8%, while imports fell by a whopping 13.5%. We don't have official data from the statistics office on quarter by quarter changes in exports, but the data we do have suggests they stagnated when compared to the third, following a pattern generally seen across Europe. Despite the almost total dependence of the economy on exports now for growth, the country still runs a goods trade deficit. And while both this and the current account deficit have improved over the last year, the rate has been painfully slow, indeed the IMF is still forecasting a CA deficit all the way through to 2016 (and presumeably beyond) with a 5% deficit in 2013 and still a 2.8% one in 2016. To put this in perspective, countries in Eastern Europe like Latvia and Hungary who have been through these corrections already now run current account surpluses, and they are still a long way from being out of the woods. Naturally, the Eastern countries are not direct beneficiaries of the ECB liquidity LTRO programmes, but while these make it easier for banks to meet their wholesale money needs, and governments to sell T bills and other instruments to banks, there is little sign they are likely to do much to help domestic credit till the correction is well advanced, and that, as we have seen may need many years. Now all of this is relatively important, since debt dynamics are (other things being equal) quite dependent on economic growth rates. Just how dependent can be seen from the chart below, prepared by Jürgen Michels and his team at Citi. As can be easily seen, it only needs a growth rate of one percentage point on average below the troika baseline scenario for debt to be sent uncontrollably upwards, and the more the average growth rate deviates downwards the more rapidly debt rises. Now there are three factors which basically determine the debt trajectory - GDP growth, interest rates on the debt and inflation. The second of these can be more-or-less determined by the rescue programme, but inflation is the catch 22, since if inflation falls to very low or negative levels this helps send debt up, while if it doesn't the country can't regain export competitiveness, and there doesn't seem to be any easy way round this, which is why I can't see the reason for policymakers being so adamant Portugal doesn't need restructuring. 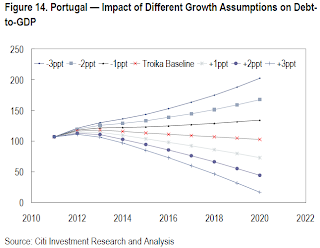 In fact this is the conclusion the Citi analysts have come to, since they are now arguing that Portugal will need a 50% PSI this year (you remember those, don't you, from recent Greece experience). 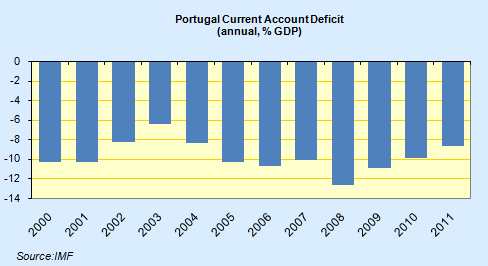 In earlier assessments of its debt position, we argued that Portugal would not be able to move on to a viable fiscal path without a haircut of 35% by the end of 2012 or in 2013. While we acknowledge that Portugal is in many aspects different from Greece, we now conclude that the size of the haircut will need to be higher, to the tune of 50%, most likely taking the form of a reduction in the debt held by the private sector. 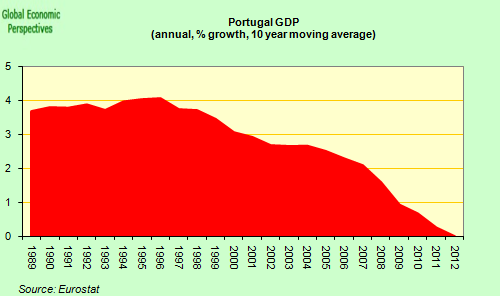 If done in 2012, a 50% haircut in the nominal value of Portuguese government debt would help to cap the peak in the debt-to-GDP ratio at around 113% in 2015. 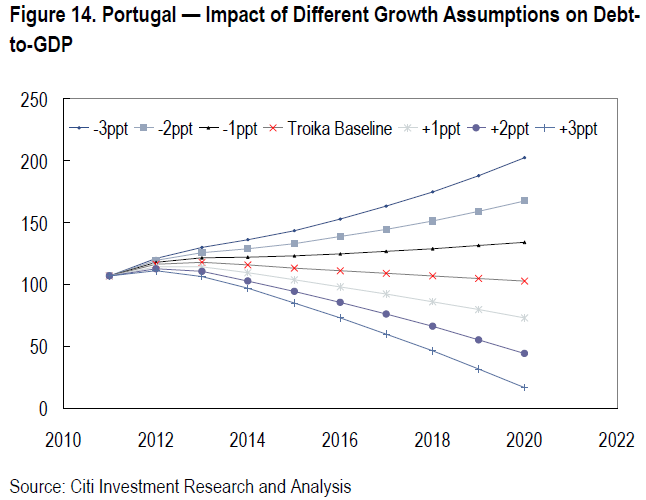 Hence, in our scenario, Portugal will need around €70bn extra funding from the Troika (plus sweeteners for the PSI) in order to close the funding gap until the end of 2015. 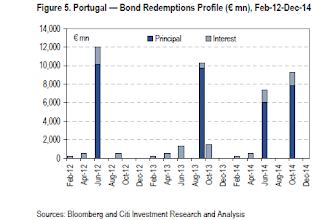 The Citi team argue the restructuring is needed simply to keep Portugal free from the need to go back to the markets before 2015, but I would argue the case on the grounds of trying to recover debt sustainabilty. 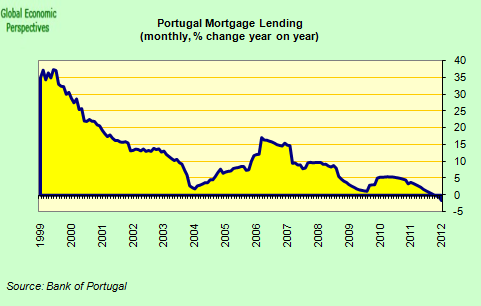 It is important to remember that Greek sovereign debt may well be lower than the Greek equivalent, but Portugal has a far higher level of private debt, and this is not sustainable and will need writing down through the banking system to some extent, and the banks will continue to need help from the sovereign in doing this. 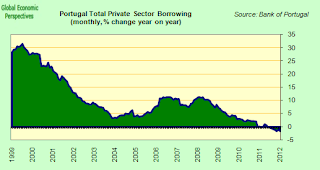 While Portugal's private sector debt is near 200% of GDP, the Greek equivalent is only something like 120%. Naturally, since Greece is only headed for 120% debt to GDP in 2020, but I think almost no one believes this level is sustainable, and it is only out of political correctness towards Mario Monti (whose countries debt nudged just above the 120% level in 2011) that anyone even vaguely genuflects in the direction of making believe it is. So action will need to be taken, and realism does need to come back into policymaking. 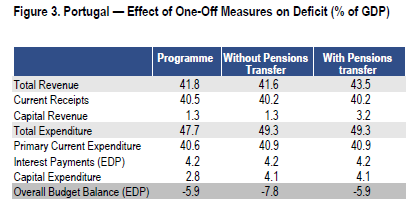 Maybe it sounds good to say that Portugal's programme is on track, but it only got back on track after 1.9% of GDP was paid over from the pension fund. 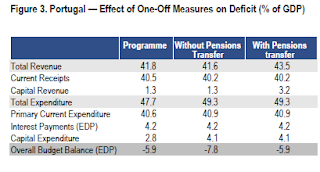 Implementation risks may be less in Portugal than in Greece, but that isn't saying much, and they are certainly considerably higher than "non negligible". Also, and as I keep saying time and again, the risk to this whole LTRO funded slow-debt-dialysis on the periphery is most certainly a political one - one of populations being "driven mad" by all the austerity and lack of hope (think Hungary). Despite Prime Minister Pedro PassosCoelho's assurances that Portugal won't follow Spain in seeking to loosen its deficit bonds in 2012, only last week Antonio Seguro, leader of the Socialist Party that secured Portugal's bailout program last May, told the Troika inspection team that the country needed more time to hit the fiscal goals set under the loan. "We affirmed our conviction that it is desirable that Portugal gets at least another year to consolidate its public accounts," he told journalists, citing the need to turn around an economy that is tipped to shrink 3 percent this year. Obviously, these programmes do not win votes for the government implementing them, and one party can seek to gain advantage over the other in electoral arithmetic by opposing them - Spain's socialist PSOE, for example, now oppose the new labour market reform introduced in that country, only weeks after coming out of office. And even the wage reductions are only seen as temporary, a way to reduce expenditure, and not as part of an internal devaluation process, in which context it is interesting to note that Romania's President, President Traian Basescu, has just said that that country's wage adjustment programme should be reversed, with salaries in the public sector being raised back to their pre-crisis level as of June 1, even though Finance Minister Bogdan Dragoi has just said he thinks the country has probably just re-entered recession. Naturally austerity isn't popular, and evidentally it doesn't work as intended, but then this was already known before we started on this course, so it isn't really a surprise. But what alternative do the Euro Area's imprisoned periphery have, since if they leave the currency and default on their debts they will be in a real mess, and if they stay they are in a real mess too? Obviously, the Euro Area countries could have a shotgun wedding, and pool debts, run a current account surplus and become a second Japan. But where exactly is Japan headed? No easy answers here, and even harder ones coming up further down the line. Petrarch, "De Remediis utriusque Fortunae"
Spain's deficit has been much in the news in recent days. Both the target for this year and actual details of last year's outcome have been the source of much comment, scrutiny, and consternation, but the deficit itself will not form the primary subject matter of this post. 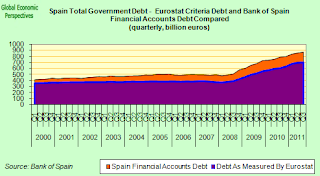 What we will be concerned with here is debt, sovereign debt, and the current trajectory of the Spanish variant. In a recent article in the Financial Times Victor Mallet draws attention to the situation and shows how an excessive emphasis on deficits may sometimes mislead people into missing the bigger picture, since at the end of the day deficits are only interesting as they add to debt, and in the long run what matters - as we have seen in the Greek case - is whether or not the debt itself is sustainable. Now Victor quotes me on two counts: the real size of Spain's debt, and the effectiveness of Spain's institutions. 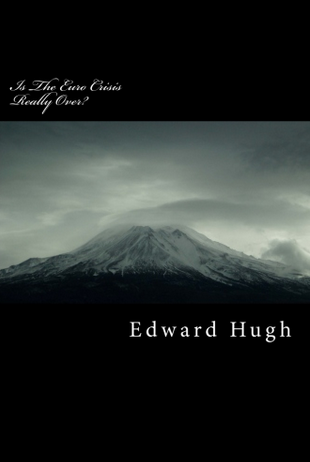 “Spanish sovereign debt is already over 80 per cent of GDP,” said Edward Hugh, a Barcelona-based economist. “I think it’s getting nearer 90 per cent"......Mr Hugh also said the situation in Spain could not be compared to the confusion in the public accounts of Greece because much of the Spanish data are public and made available by the Bank of Spain, or can be deduced from official sources. But he added that the centre-right government’s transparency risked curbing Spain’s room for manoeuvre should the crisis deepen further. Well, while it's the first claim that is controversial and in need of justification (and believe me Victor Mallet demanded to see the justification for the numbers before putting up the quote) let's start with the second one first as it forms an important part of the background. 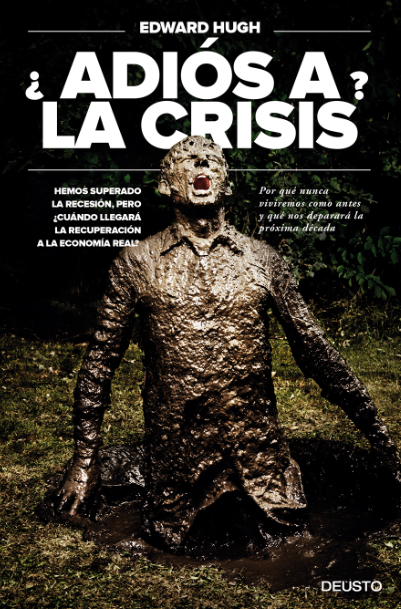 I think it is very important to understand that Spain is not Greece, in the important sense that the people in change do in fact normally know what is going on. They have auditors and inspectors whose job it is to know, and they do do their job. So the Bank of Spain know virtually everything there is to know about each and every one of Spains many banks and savings banks, about the state of their balance sheets, about the level of bad loans, etc etc. Naturally, knowing what they do, what they tell you is another matter. Similarly in the case of the public administration, auditors and controllers are in place to constantly measure and follow the exectution of the annual budget at all levels, but again what they know is often one thing, and what they actually say publically is another. When Spain's bank regulators become worried about specific cases they try their best to put on a brave face and maintain confidence while looking for solutions somewhere behind the curtain. Similarly with the public administration, although in this latter case there may well be political reasons for allowing an overspend to continue, or even for encouraging it. 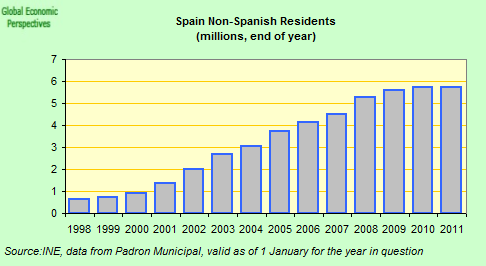 We know with some degree of accuracy the number of such migrants present (although not authorised to be) in Spain due to the existence of a system known as the "Padron Municipal" (or Municipal Register) which is managed via an electronic database. So we know how many migrants register, but how do we know that the migrants always register? 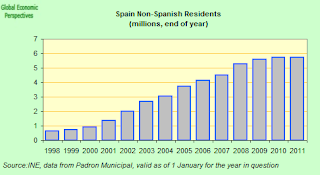 Well this is the part which is "typically Spanish", since a far from innocent circularity has been created - all those present in Spain are entitled to free health treatment in the public health service, but in order to have a health card you need to register with the Padron Municipal. In addition, registration adds to the possibilities of being able to regularise your situation later, so the first thing virtually every migrant does is go to register. You see, that way the central adminstration has all the data to hand. Well, you may say, that is fine, but how do we know the register doesn't overstate the number of migrants? In fact, at one point it did, since migrants were only obliged to confirm their continuing presence every two years. That was when the focus was on measuring who was coming in, but since the economic crash and the massive surge in unemployment, for a variety of reasons the emphasis has moved towards measuring who is still here. So the interval for address confirmations and things like that has changed, and most of those who don't have residence rights are now required to confirm their presence every few months, which means that Spain has some of the most accurate data on migrant flows to be found within the confines of the EU (and possibly anywhere). Now, you might say, why be so meticulous in collecting all this information, why not follow the UK example, and require all those who lack authorisation to be in the country to leave? Well, this is Spain and not the UK (or Greece) and this is the point of the present rigmarole I am explaining, to give an idea of how things work in Spain, not to offer an analysis of the migration policy. Understanding that you can accurately measure something that officially doesn't exist is the key to understanding how the financial and public administration systems work, and unless you "get" this part, you will be lead astray by almost everything else. The Omnipresence of "Dinero B"
Now, on the public accounts issue itself , I actually started digging into all this in the summer of 2010, and indeed posted an interim "report" at the time. So it is something of a mystery to me why all the hedge funds, journalists and bank analysts have taken so long in waking up to the existence of "Spain's regional and local debt problem", especially since all the information on the topic is freely available on the Bank of Spain website. It seems to me that people see what they want to see at any given point in time, and this is the point of the Petrarch quote which starts this post. It comes from an Edgar Allen Poe short story, the purloined letter, and to cut a long issue short, a letter goes missing which no one can find, and the reason they cannot find it is precisely because it is lying there, right before them, on the living room mantelpiece. "Nothing" remember, "is more hateful to wisdom (astucia) than true cleverness", which means if you try to go rummaging round round Spain for Goldman-Sachs-style interest-rate-swaps you will almost certainly leave empty handed. Handiwork here is all much simpler, and more artesanal than that, and therein lies the beauty and the sophistocation of the thing. Hence, if you are someone who is really interested in trying to answer the question about just how high the present level of Spanish sovereign debt actually is (officially it was to have been 67.8% of GDP in December, but that estimate was made before the latest set of budget deficit "revelations" and when the estimate of 2011 GDP was rather higher than it turned out to be, so it is probably nearer to 70% now, even on the official Eurostat EDP measure) you should start here, with the Financial Accounts of the Spanish Economy. The part you really need is Chapter Two the "Financial Accounts" - actually, I will add in a small but revealing personal anecdote here, since when I sent all these links off to the IMF Spanish Mission Head back in the spring of 2010 he mailed me back saying "thanks a lot" - he plainly didn't know that this sort of thing existed., although the Spanish head of Global Financial issues for the IMF - ex Bank of Spain man José Viñals - most surely did, but he simply hadn't seen fit to brief his colleague. As I say, this is how Spain works, you have to ask the right person the exactly right question, and make sure you don't get sidetracked. Otherwise you will learn nothing apart from a lot of useless and most likely thoroughly misleading information. 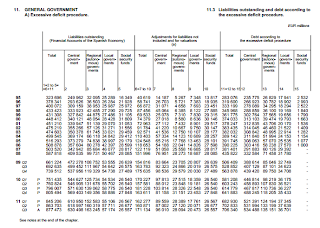 But before we did down any deeper, just to let us all see where we are, why don't we make a small detour to Chapter 11 of the Bank of Spain's Statistical Bulletin, on General government liabilities. 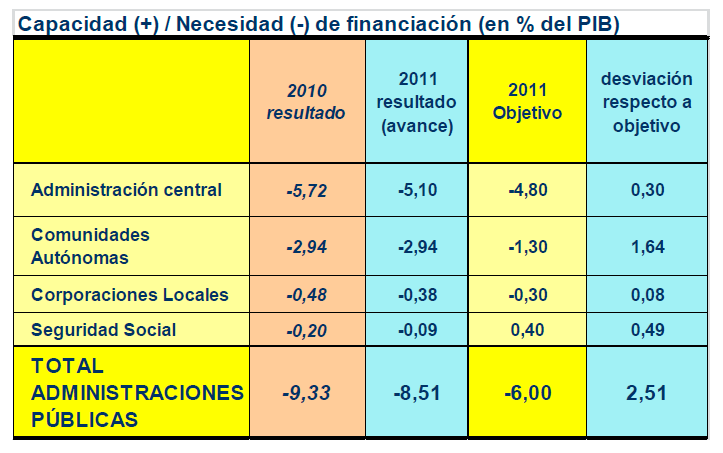 Excessive Deficit Procedure (EDP) debt. Now if we examine section 11.3 Liabilities outstanding and debt according to the excessive deficit procedure. Absolute values, we will find this most iluminating table. 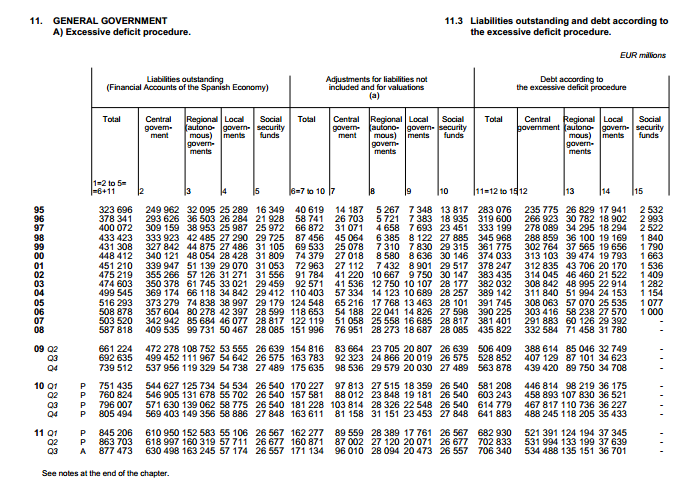 Two important points should be drawn to the attention of the studious reader immediately, the fact that the right hand section refers to the Excess Deficit Procedure (EDP or officially recognised Eurostat) debt, and that the totals at the bottom of columns one and 15 are different. The number at the bottom of column one is approximately 877 billion Euros (or around 85% of Spanish GDP) while the number at the bottom of column 15 is 706 billion Euros, and this is the official Eurostat debt. So what makes for the difference? Well, as we will see, there are three main items - unpaid bills, public company debt, and Spanish sovereign bonds which are in the hands of the Social Security Reserve Fund. 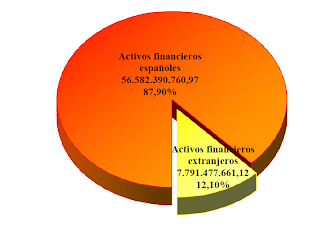 Now before going into all this further, I do want to make clear that I am not saying that this 877 billion euros is the total Spanish debt which should be counted as such. The number is simply orientative - a lot, but not all, of this is debt which will need to be consolidated - but in fact, and in addition, there are other "contingent liabilities" which will also need to be added in to get a complete reading.. But let's go one step at a time, and why not start with those famous "unpaid bills". Well, according to the Financial Accounts, at the end of the third quarter there were 72.9 billion Euros in unpaid bills (around 7% of GDP) which were more than 30 days overdue owed by the entire public adminstration (see this file here, bottom right second page - in fact there is a total of 87.5 billion Euros owing, but 14.6 billion is still within the term of normal trade credit). This breaks down as 27.7 billion Euros on the part of central government, 20.8 billion Euros from the regional governments, and 14.9 billion Euros for the local authorities. Much of this debt has been pending for months, if not years. It also makes the number of 35 billion Euros which is being bandied about in Spain for the credit lines to local authorities and regional governments seem quite reasonable and realistic. Of course, the central government itself still will need to put its own house in order. The second main area of non-consolidated debt is the money owed by public companies, many of them loss making, and often entities which have been created without rhyme or reason at both regional and local authority level. As of the end of the third quarter of 2011 this debt amounted to 57 billion Euros (or 5% of GDP - see the memorandum item on the far right in this file), of which 32 billion Euros was attributable to central government, 15.5 billion Euros belonged to regional governments, and 9.4 billion Euros came from companies created by local authorities. 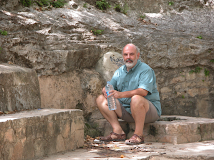 There is no plan at present for dealing with all this accumulated debt. Now doubtless the only reason the fund decided to invest the money it was holding in Spanish government bonds wasn't to help the administration hide some debt, probably the fact that risky Spanish bonds pay more than less risky German ones was also a consideration. But this whole thing is a farce, since while the Spanish people innocently believe that they have a partially funded pension system, nothing could really be farther from the truth. In general accounting terms the whole security area comes under the general budget, as was brought to light in the recent deficit numbers the new government brought to light at the start of January. Out of a total of 2.5% of GDP in unexpected deficit, 0.5% came from issues associated with the social security fund - which anticipated a surplus of 0.4% of GDP but finally turned in a deficit of 0.1% of GDP, as can be seen in the nice chart provided by the Ministry (below). The shortfall was due to a number of factors. In the first place those newly entering the system are paid far more than those who are leaving (due to death or other reasons) - 35% more in fact, since the average monthly payment in 2010 was around 800 Euros, while the average payment to new entrants was 1,100 Euros. Secondly Spain's demography is working against the fund, since as the number of those working falls, and the number of elderly dependents rises, the ratio between the two falls. It is currently at around 2.4, and many experts estimate that the pension system will turn critical when the figure drops below 2. 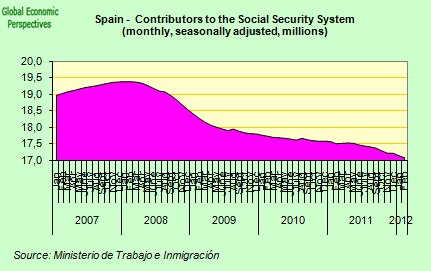 Currently there are just under 17 million contributors, but the position is worse than it seems, since of these three million are unemployed, with their contributions being paid by another department, and these contributions will terminate when the individuals concerned exhaust their unemployment entitlements. According to Spanish public pensions expert José Mario Paredes Rodríguez, "the data on contributor pensioner ratios is totally misleading" given that the government continues to count as contributors those for whom it is making payments the "calculation is completely unreal since what we need to know is how many people are actually working per pensioner being supported. So we really have a clear "robbing Peter to pay Paul" type situation, where the numbers are juggled but the debt remains. This risks associated with this situation was brought to light in the recent Greek debt restructuring, since one of the key issues driving Greek politicians to the negotiating table was the threat of seeing their pension fund reserves going up in smoke in the event of a hard default. 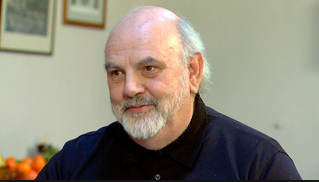 "The total portfolio of Greek bonds that the Greek pension funds hold is EUR27 billion," Venizelos said. "That portfolio is being replaced with cash, with new, better bonds of much higher net present value and, further, the parliament has already approved the creation of a special public body through which to transfer public assets to the funds," he added. "The dilemma we are faced with is cuts so that we can stand on our own two feet, to save the country’s pension system and pensions, or economic collapse,” Finance Minister Evangelos Venizelos told opposition party lawmakers in Parliament today. Without the debt swap, the country’s pension funds would be wiped out, he said. The country’s central government debt, which doesn’t include debt from local government organizations, state-run companies or pension funds, was 368 billion euros at the end of 2011, the ministry said today, amounting to 171 percent of the economy, according to Bloomberg calculations". The trouble is, this still isn't everything. We also have the contingent liabilities of the state to think about. This - a groso modo - comes in four forms: bank debt guarantees, exposure to the financial system via FROB, the government Instituto de Credito Oficial (ICO) and the Electricity Tariff Fund FADE. In the case of FROB (Fund For Orderly Bank Restructuring) the true extent of the government's exposure is hard to measure, since while the quantity actually provided by the fund to date is not large (14.8 billion Euros - see this presentation - and 9 billion Euros of FROB debt has been pre-capitalised) a number of savings banks are effectively nationalised while others that are dependent on FROB for loans may well need further intervention. 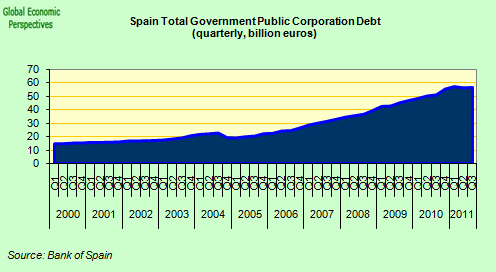 So all we can safely say here is that the number involved is hardly trivial, and on just how "non trivial" the final number is the whole future of Spain's soverign debt will ultimately depend. Finally, we have the so called Tariff Deficit fund, or FADE (Fondo de Amortización del Déficit Eléctrico). Now despite the name, one thing the debt generated by this body doesn't do is fade (away), since it is growing month by month and year by year. The position is described in the literature as a debt being accumulated by consumers (some 24 billion Euros of it) which is guaranteed by the government. Like the state of their savings in the pension system, most electricity consumers are totally ignorant of the fact that they are acquiring this debt, or better put, that it is being acquired on their behalf. Essentially the situation arises since the government is reluctant to charge an economic price for electricity. Naturally, in a country running an energy driven current account deficit this is a highly questionable practice, but then, there you are. Basically every month less money comes in in bills than is attributed to the accounts of the electricity companies. The shortfall is made up by borrowing. This borrowing is serviced - you got it - by taking some of the income from electricity bills. But naturally, as the deficit grows - currently it is about 24 billion Euros - more of the income stream is needed to service the exisiting debt, and - yup, you got it again - the deficit grows. The only real solution to this mess is to raise electricity tariffs, but in an environment of rising unemployment and falling wages there are going to be limits to what the government can do in this regard. So while I am sure that the EU will eventually insist tariffs are raised, it is hard to see them being raised far enough to pay off the accumulated debt, and so the government will almost certainly need to "swallow" this, which means - yup you got it again - another 2% or so on the debt account. Just to round things off, there are some other little details, like public private collaborations in infrastructure. Take motorways for example, many of these (especially around Madrid) were planned at the height of the boom, when traffic was intense - the private sector are of course paid according to the number of cars who use the motorway. Now with the crisis the volume of traffic has fallen considerably everywhere (this is one of the few advantages I have noticed of all this difficult mess, it is now much easier to move around in Barcelona). And with the fall in traffic, incomes have fallen, to such an extent that the participating companies are no longer able to service their debt. Experts suggest the total quantity involved is around 4 billion Euros - peanuts you may think in comparison with the other things we are looking at, but as they say in Spanish "todo suma". But the great risk they are taking in doing this is raising the acknowledged debt level, up towards the "high risk area" of around 100% of GDP. When you add all the debt up we are already in the high 80% range, and two more years of "normal" deficit plus more funding for the financial sector should take it through the psychological barrier. 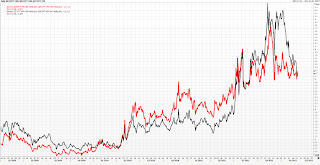 Naturally investors are noticing this, and Prime Minister Mariano Rajoy's "gaffs", and at the end of last week the Spanish ten year bond spread with the Bund equivalent went above the Italian one for the first time since last summer. So Spain is on a bad course, with recognised debt about to surge rapidly, while investor confidence in the current administration is slipping. Time for another "gamechanger" I think, since otherwise this car is about to crash.